Is Your Marketing Campaign Ready for the Next Correction? How much would you bet that the market will decline 10% or more within the next year? I hope you’d bet something, not just because the market has been hovering around all time highs, but because a 10% correction has happened on average of about once per year from 1900 to 2015. If you’re like most advisors, you know that market declines are a normal part of investing. But if you know that a correction is coming, why don’t you have a marketing campaign ready to take advantage of the event? Downturns are powerful marketing opportunities for two reasons. First, your marketing campaign about a correction is likely to get twice as many views as other campaigns. Second, prospects have unprecedented urgency to act during an uncomfortable market decline. Yet very few advisors have a plan ready in advance to address a downturn. The water came in a thirty-year cycle. There would be wet and wonderful years when the land would shout with grass. And then the dry years would come. The land cracked and the springs dried up and the cattle listlessly nibbled dry twigs. Some families would sell out for nearly nothing and move away. And it never failed that during the dry years the people forgot about the rich years, and during the wet years they lost all memory of the dry years. It was always that way. When the market goes down, you’re inundated with phone calls and doing your best to placate nervous clients. There’s no time to create and launch a campaign that uses the correction as a marketing opportunity. The good news is that with pullbacks coming about every year, you have an annual marketing opportunity to reach prospects at their peak point of urgency. You could practically build a place into your marketing calendar for this piece of communication. Now is the time to get a post ready to go that not only reassures your clients, but offers a referral opportunity. Proactively communicating is good client service. Your clients hire you to not only help plan for their financial future, but to educate them in good times and in bad. They are eager to hear from you to get an explanation of what’s going on and receive some guidance on what they should do about it. Proactive communication results in fewer phone calls and panicked clients. If you’re able to act quickly, clients are more likely to trust that you’re prepared for the volatility and they’ll feel they’re in good hands. This results in less time educating and calming individual skittish clients. What Should You Say About a Correction? This is expected. Explain that you have been anticipating a downturn and that it’s a normal and healthy part of market cycles. Point to historical data that shows the frequency of similar events. Your portfolio is not down as much as the market. Remind your clients that while the S&P 500 may be down 10% percent, their accounts are not invested in the index and have therefore declined less than the market. Urge them to call you if they have questions about their individual accounts. Now is not the time to sell. Explain that no one can consistently predict the right time to get in or out of the market. It’s human nature to lose patience and sell at or near the bottom of a downturn. Even if you were able to get out early in a decline, you’d still have to guess when to get back into the market and you’d likely guess wrong. You have not realized any losses yet. You only realize losses when you sell, so it’s critical not to sell when the market is down. It’s normal to feel uncomfortable when the market is down, especially if you’re approaching retirement. However, each time in history that the market has gone down, it has come back up again. 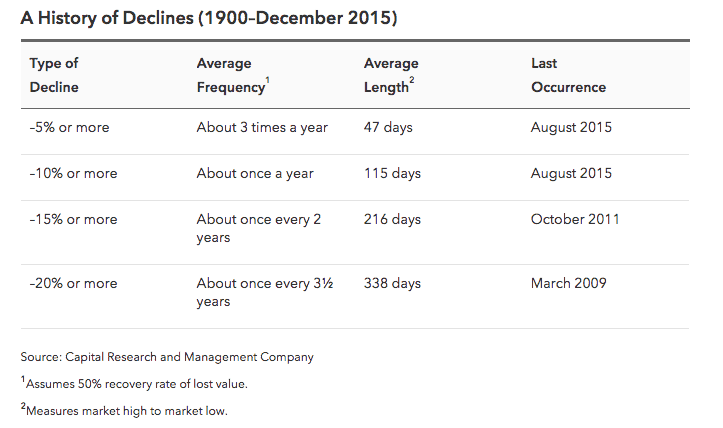 Average downturns of 10% are likely to return to normal within about 115 days, based on historical data. Stay focused on the long-term. Remind clients that you’ve built their financial plan and investment strategy for the long-term, with short-term volatility in mind. While a correction can be upsetting, there’s no reason to deviate from their long-term financial plan. Call if you have questions. Encourage them to get in touch if they are feeling nervous or want to review their accounts. Now that you’ve proactively communicated with your existing clients, it’s time to use the market downturn as an opportunity. The Red Cross is always at the ready to deploy fundraising campaigns as soon as a disaster strikes. This doesn’t make them greedy; it simply allows them to strike while the iron is hot so they have the funds for the following disaster. Include a deal for clients’ friends and family. Offer to provide a free second opinion and recommendations to minimize losses. Provide an easy action to take. Share a link to schedule a 15-minute investment review by phone (more on how to do this next week, subscribe to my newsletter to get the instructions). This way, even if prospects read your email after hours, they can take action when they’re feeling peak urgency and sleep better that night. If you need help creating a marketing campaign to have ready for the next correction, fill out the form below and I’ll send you a free template you can customize and have at the ready! This template version can even be sent through compliance in advance, since it does not include specifics that will need to be updated. I hope it’s helpful to get your marketing ready for the next decline and help you sleep better at night, knowing you’re prepared! Claire Akin is a former advisor, turned marketer, who may turn back into an advisor again in another decade. She runs Indigo Marketing Agency, a full-service marketing firm serving financial advisors. Claire holds her MBA in Marketing from the Rady School of Management at UC San Diego as well as a BA in Economics from UC Davis. 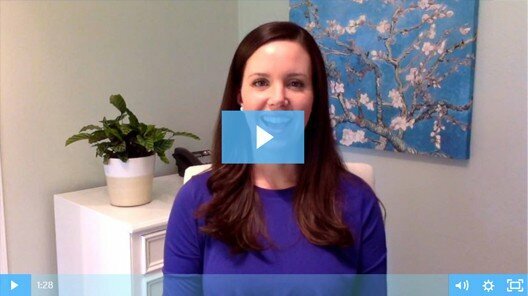 It’s her goal to help advisors leverage technology to grow their businesses.